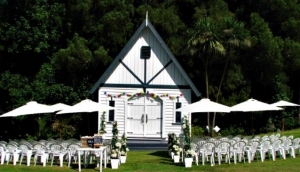 Auckland's diverse landscape offers wedding parties a wide variety of wedding venues. Downtown, many of the larger hotel chains are adept at managing all aspects of weddings with dedicated wedding teams. The North Shore is dotted with wedding venues that take advantage of the coastline and pristine beaches, with Devonport and Takapuna being popular spots. Heading out to Mission Bay, a few dedicated wedding venues offer beautiful views of the Hauraki Gulf and Rangitoto Island. Waiheke Island is a 35 minute ferry from downtown Auckland , featuring over 30 wineries and 100 beaches, while west of Auckland the Waitakere Ranges offer 40,000 hectares of rainforest and and untamed coastline as a backdrop to get married. Use our Auckland Wedding Venues guide to find your dream setting for that special occasion.